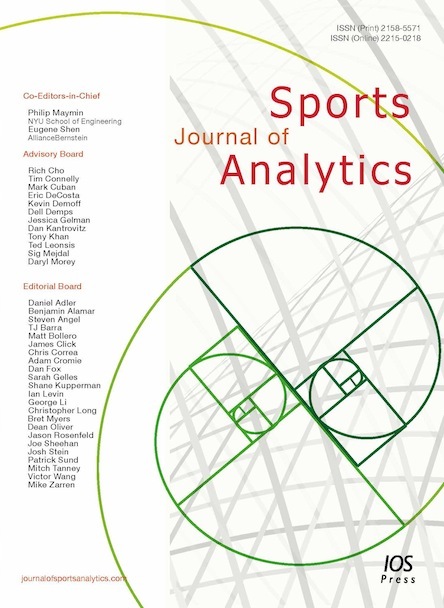 The Journal of Sports Analytics (JSA) aims to be the central forum for the discussion of practical applications of sports analytics research, serving team owners, general managers, coaches, fans, and academics. We invite analytical research on any single sport or across sports that seeks to improve our understanding of the game or strategies for improving a team or a league. We are currently soliciting submissions for future issues. All submissions will be double-blind peer reviewed. There are no author submission fees. Authors are requested to submit their manuscript here. Note that the manuscript should be uploaded as one file with tables and figures included. This file can be a Word document, a PDF, or a zip file. After the article has been accepted, the authors should submit the final version as source files, including a word processor file of the text, such as Word or LateX (If using LaTeX, please use the standard article.sty as a style file and also send a PDF version of the LaTeX file). See also our website for more information about this option IOS Press Open Library® . For the Journal of Sports Analytics the OA fees are currently being waived. Manuscripts must be written in English. Authors whose native language is not English are advised to seek the advice of a native English speaker, before submitting their manuscripts. Peerwith offers a language and copyediting service to all scientists who want to publish their manuscript in scientific peer-reviewed periodicals and books. Each table should be provided on a separate page of the manuscript. Tables should not be included in the text. References to other publications must be in Harvard style and carefully checked for completeness, accuracy and consistency. This is very important in an electronic environment because it enables your readers to exploit the Reference Linking facility on the database and link back to the works you have cited through CrossRef. When making reference to an author's work in your text, their name is followed by the year of publication of their work: In general, when writing for a professional publication, it is good practice to make reference to other relevant published work. This view has been supported in the work of Cormack (1994). Where you are mentioning a particular part of the work, and making direct reference to this, a page reference should be included: Cormack (1994, pp.32-33) states that "when writing for a professional readership, writers invariably make reference to already published works". If you make reference to a work or piece of research without mentioning the author in the text then both the author's name and publication year are placed at the relevant point in the sentence or at the end of the sentence in brackets: Making reference to published work appears to be characteristic of writing for a professional audience (Cormack, 1994). Number figures as Fig. 1, Fig. 2, etc and refer to all of them in the text. Each figure should be provided on a separate sheet. Figures should not be included in the text. Accepted articles will be placed online as "pre-press" articles shortly after acceptance. This process will occur before the author receives proofs. The pre-press file will remain as the uncorrected proof version until the article is published in an issue and the final published version replaces the pre-press file.